Aside from the true French wine-like corked beer bottles where you absolutely need a corkscrew to drink the beer (or sabre it), this may have been the most frustrating beer bottle to open in my life. I love Barn Hammer Brewing, I try to meet up with Tyler & Brian at the brewery whenever I'm in town but that's rare now days. 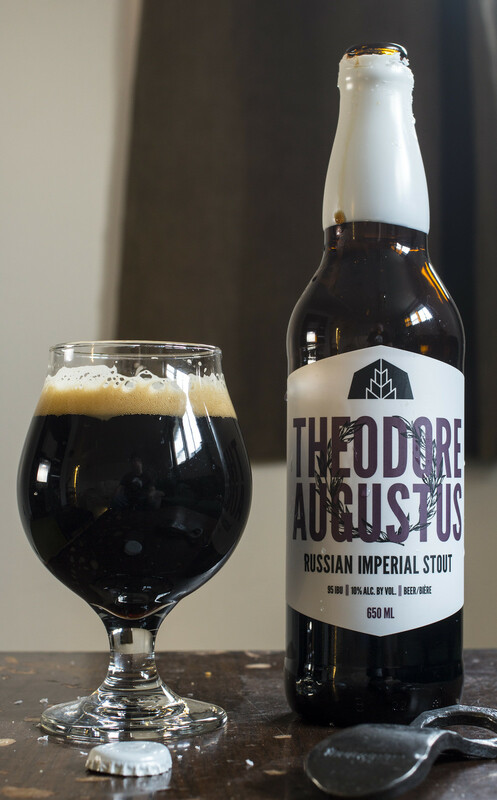 They're finally bottling their beer and their Theodore Augustus Russian Imperial Stout bottle is the most frustrating bottle to open. 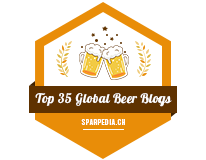 I am in the minority of beer geeks who actually like wax on beer bottles as it helps preserve the beer better for aging to an extent. However, opening Theodore was a chore and a half - there was (what seemed like) half an inch of wax so my trusty cast iron Torque opener was having trouble chipping away at the wax, then the sharpest knife I could find had just as difficulty to get rid of the wax (and lightly cut myself along the way). I had to put the bottle cap side down under hot water for two minutes until it was good enough where I could just peel it off and finally drink the beer! Anywho, I'm absolutely happy to see the guys over at Barn Hammer now bottling, even though it's not available in Brandon yet. Barn Hammer is the first brewery to open up in Manitoba since 2006 (Half Pints) and they were the first brewery in Manitoba to give beer drinkers that brewery tasting room experience that every other major (and minor) North American city has been experiencing for at least five years from now. As you can tell, I was eventually able to get some of the wax off the bottle so I could do a review of their Theodore Augustus Russian Imperial Stout. Theodore Augustus tops out at 10% ABV and a staggering 95 IBU! I love Russian stouts.. and most stouts but I'm a seasonal kind of guy so usually in late April I'd get bored of them.. but it's been a really chilly April so I'm starting to crave them again! Appearance: Theo pours the typical rich black-as-night stout with a cola brown hue to it. There's a very light amount of creamy beige head on top, mostly at the side of the glass. As the beer is being savoured (pretty quickly), the foam collects to the side of the glass leaving behind a bit of residue. Aroma: Pretty smooth for a Russian Imperial Stout - I get a liberal amount of cocoa powder right from the beginning that reminds me of my grandma's cakes and cookies. The roasted malt profile is light to moderate, there certainly is a decent amount of coffee aroma to it but not as much as most stouts I've had lately. Barn Hammer describes this as being dark and smooth and I believe it 100%. It's not overly complicated but welcoming at the same time. Taste: The very first impression I get is a combination of booziness AND roasted malt at the exact same time, giving off a warmth of alcohol and a roasted coffee flavour to it. There's a great deal of cocoa to it giving it a sweet, chocolatey taste to it. There's also an earthy hop presence that's a tad reminiscent of peat that lingers on the palate for a bit at the end. Aside from that, that's about it - simple yet straight forward. 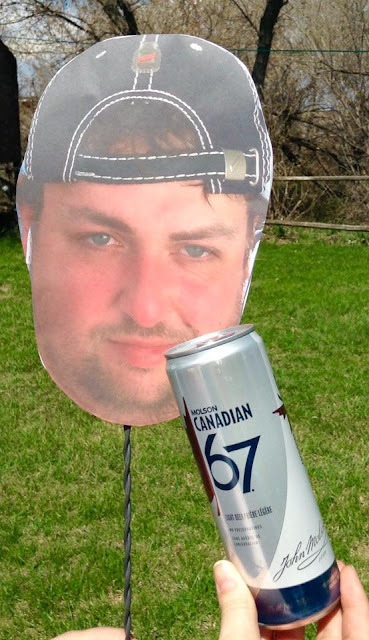 Overall Thoughts: I just realized this was my very first Barn Hammer beer review over here at BeerCrank.ca. I've been wanting to review their beer for a long long time but usually Brandon only gets growlers of their beer once every 2-4 months or so and since I'm not from Winnipeg, I'm not lucky enough to visit the tasting room that often. While Theodore Augustus was really straight forward as you could tell, it was simply delicious. I'm happy I bought another bottle but I'm likely going to send that bottle off to a friend in Montreal soon. At $8.50/650mL bottle, this is a serious bargain. It's still available at a few LCs in Winnipeg for now, and likely still at the Quality Inn Beer Store. Also, don't forget to check out my visit to Barn Hammer from 2016.